Finally, if we add Texas to this chart, we see how the seismic shift in Republican fundraising success has been particularly pronounced in Texas. In 1980, Republican candidates for Congress from Texas raised only 35 percent of all funds. By 2002, Republican congressional candidates raked in 60 percent of political money. The successes of Republican candidates for major statewide office, notably Bill Clements's 1986 victory in the governor's race, helped build Texas Republicans' financial base along the way. 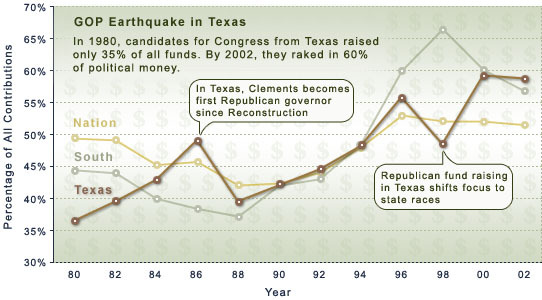 The one apparent exception  the 1998 election (the dip in the brown Texas line on the chart)  actually reflects the growing fundraising and electoral success of Texas Republicans generally, in races not reflected in the chart. The party's financial base poured money into numerous successful state races, notably Governor Bush's 1998 landslide reelection over Democrat Gary Mauro. As a result, less money was contributed to congressional races. Yet, while momentarily behind in fundraising, Texas Republicans in the U.S. House still picked up a seat that year and in 2000 again surged ahead in the money race.